NHTSA Administrator Mark Rosekind at today's hearing: "It is hard to imagine that these repairs can happen fast enough for anyone." WASHINGTON -- The National Highway Traffic Safety Administration said it will decide by Thanksgiving whether to order additional measures to speed up the recalls of more than 19 million U.S. vehicles with Takata airbag inflators that may explode in a crash. The defective Takata inflators have been linked to 8 deaths and around 100 injuries, but more than a year after the recalls began to significantly grow in volume, fewer than a quarter of the vehicles have been repaired, NHTSA officials said in a presentation today. As a result, NHTSA said it’s studying several steps to speed or possibly expand the Takata recalls. “It is hard to imagine that these repairs can happen fast enough for anyone,” said NHTSA Administrator Mark Rosekind. Expanding the recalls to cover even more vehicles in the future. NHTSA’s presentation today was a summary of its early findings from a months-long investigation into Takata’s defective airbag inflators and an update on its efforts to coordinate a response. The agency has assumed a broad role in overseeing the search for clues about why the inflators rupture, and in coordinating the repairs of recalled vehicles from 12 different manufacturers, with replacement parts from several airbag suppliers, including Takata. To help identify which vehicles presented the greatest risk, NHTSA instructed the 12 automakers involved in the recalls to conduct a risk assessment. That assessment found that 6 million Takata inflators from all automakers are in the highest-risk group that should take top priority for replacement parts. Some 11 million inflators are in the second-highest priority group while about 2 million are in the third priority group, said Stephen Ridella, director of NHTSA’s office of vehicle crashworthiness research. NHTSA said testing by the agency and manufacturers has shown that both the age of the inflator and prolonged exposure to high absolute humidity are risk factors that increase the likelihood of an inflator rupture, though a definitive root cause remains elusive. As part of its plan, NHTSA wants replacement inflators to go the oldest vehicles that have spent the most time in hot, humid climates -- eight to 10 years in places like Miami, for example. In these areas of “high absolute humidity,” a region mostly along the Gulf of Mexico, NHTSA officials said repairs have been made to about 29.5 percent of recalled vehicles. Nationally, the recall completion rate is running at 22.5 percent, they said. And while the pace of repairs is speeding up, the current rates “are simply not good enough to address the risk these inflators pose to the driving public,” said Jennifer Timian, recall management chief at NHTSA. 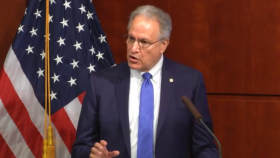 Rosekind said the responsibility for repairing defective vehicles lay with manufacturers, but warned consumers to do their part by paying attention to mailed recall notices and staying in contact with dealers regarding the availability of replacement parts.